Quantitative easing (QE) — undoubtedly the boldest policy experiment in the modern history of central banking. As the northern hemisphere endures record-breaking temperatures, scientists and meteorologists are looking at the possible causes. In the summer of 1989 Poles peacefully dismantled the communist system that had blighted their country since the end of the second world war. The jet stream forms a boundary between the cold north and the warmer south, but the lower temperature difference means the winds are now weaker. This means the jet stream meanders more, with big loops bringing warm air to the frozen north and cold air into warmer southern climes. Furthermore, researchers say, the changes mean the loops can remain stuck over regions for weeks, rather than being blown westwards as in the past. Investors should, but rarely do, anticipate the enormous growth deceleration that occurs once tiny companies in emerging industries become behemoths in mature industries. You can’t just look backward and extrapolate. While risk no longer sits in the banking system, it has not vanished. It grows ever clearer that risk has been moved, primarily to the pension system. Vad känner unga vuxna när samma lön och anställning köper betydligt mindre bostad än för tidigare generationer? I en intervju i The Guardian lyfter klimatforskaren Dann Mitchell exempelvis fram svaga jetströmmar – starka vindar på mycket hög höjd – som en delförklaring till att värmen vägrar släppa taget om norra halvklotet. Higher-than-desirable current account balances prevail in northern Europe—in countries such as Germany, the Netherlands, and Sweden—as well as in parts of Asia—in economies like China, Korea, and Singapore. While the current configuration of global excess imbalances does not pose an imminent danger, we project that, under planned policies, these imbalances will grow over the medium term, eventually posing a risk to global stability. The correlation between the S&P 500 over the past four years and the four years leading up to the 1937 top is roughly 94%. As I have suggested in the past, price analogs are not very valuable on their own but when the fundamentals also parallel closely they become far more interesting. “If something can’t go on forever, it will stop.” This statement by Herbert Stein, chairman of the US council of economic advisers under Richard Nixon and Gerald Ford, tells us that debt cannot grow faster than an economy forever. That is going to be true for China, too. After four devaluations in seven months and a forecasted financing gap of about $16bn over the next three years, Pakistan is facing another balance of payments crisis. Even if financial firms avoid another crisis along the lines of the near-meltdowns earlier this year of Bear Stearns and Countrywide (CFC, Fortune 500), some economists say problems in the financial sector are only beginning to be felt on Main Street. "The real economy hasn't yet taken the hit," says Northern Trust economist Asha Bangalore. Roubini For the first time in a decade, the biggest risks are now stagflationary (slower growth and higher inflation). These risks include the negative supply shock that could come from a trade war; higher oil prices, owing to politically motivated supply constraints; and inflationary domestic policies in the US. Jennifer A. Francis, an Arctic researcher at Rutgers University. Temperature differences between the Arctic and the lower latitudes help create the jet stream. Because the Arctic is warming twice as fast as the rest of the Earth, that temperature difference is getting smaller. As a result, the jet stream is getting weaker and shifting its behavior, sending cold air south from the Arctic and pumping warm air north. För Afrika (1,3 miljarder) är prognosen 2,5 miljarder till 2050, och hela 4,5 miljarder till 2100. Temperatures reached 40.7C in central Japan earlier this week, a five-year nationwide peak. In the city of Kyoto temperatures have stood above 38C (100.4F) for seven days in a row for the first time since records began in the 19th Century. Brandläget är mycket värre och /den svenska/ rapporteringen därom mycket mer kortsiktigt i tid och rum än vad man vill tro. Här har jag samlat min alternativa bild om vad som pågår. Dessutom ser man med en knapptryckning att torkan och värmen skall bestå under åtminstone tio dagar. Det kan bli mer. Klicka på Vindar längre ner på sidan. "Somewhat unusual weather patterns", how much can we attribute to jet stream ? while taking into account both natural and seasonal changes? 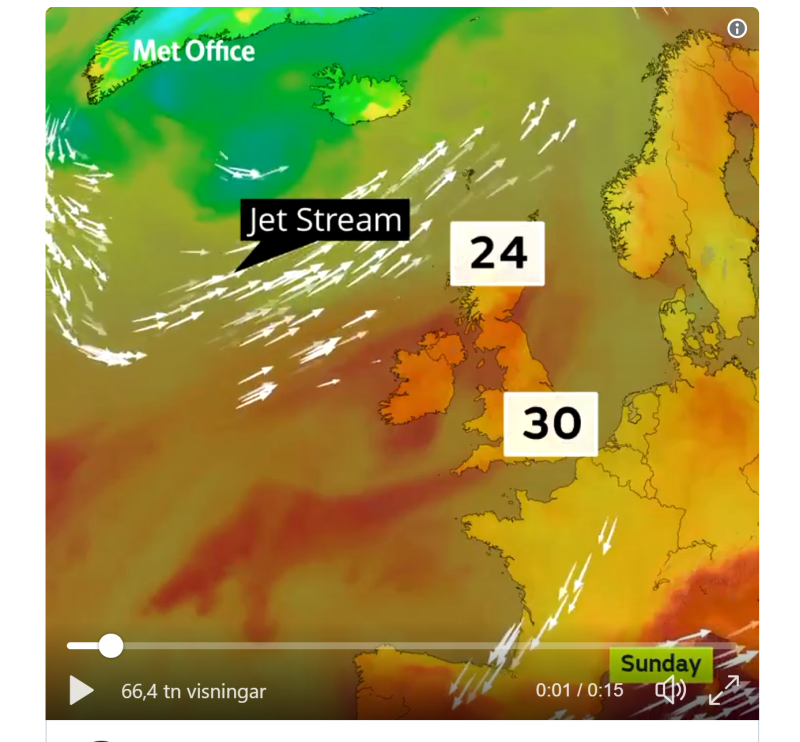 During a period with a strong jet stream, weather conditions at the surface tend not to stay in position for long periods of time since the jet stream moves them away quickly. When the jet stream is weak however, these waves become more amplified (the waves are larger) and move more slowly. Weather patterns at the surface may remain in the same position for longer periods of time and can remain stuck for many days, or even weeks. This is particularly significant during more extreme weather events. Long periods of heavy rain lead to flooding, or conversely long term dry conditions lead to drought. Macroeconomists should think about credit policy as an important supplement to the traditional fiscal and monetary tools of recession-fighting. And a quick review of the facts underscores that they are even more unnatural holders of Uncle Sam's debt than China, Japan or Russia. For instance, Ireland's $301 billion of holdings amounts to 90% of its $330 billion GDP. We seriously doubt that its central bank was in the business of "investing" nearly the totality of its national income in Uncle Sam's low yielding paper. For many westerners the point of the EU is to bind countries into a peace project that also delivers economic benefits by obliging them to pool sovereignty; “nationalism” thus becomes a dirty word. But for easterners, joining the EU was in part a guarantee of the national sovereignty that had been squashed during decades of subjugation by the Soviet empire. Av 3 597 048 MSEK i utlåning till hushållen står Swedbank, Handelsbanken, SEB och Nordea för 74 %. A study published earlier this year in Science offers an explanation for a mysterious and sometimes deadly weather pattern in which the jet stream, the global air currents that circle the Earth, stalls out over a region. Det är troligt att det verkliga antalet döda var kanske 30 eller 40 miljoner. Första världskriget slukade 9,2 miljoner soldatliv och sammanlagt omkring 15 miljoner människor. The findings suggest the latitude of the Atlantic jet stream in summer is influenced by several factors, including sea surface temperatures, solar variability, and the extent of Arctic sea-ice. That is a lower inflation rate than even the Bundesbank achieved during its celebrated pre-euro history, and it is a tighter target than virtually all other central banks pursue. The pessimists believe that markets drive the economy. In their view, near-zero interest rates and quantitative easing, or QE, pushed investors out of government bonds and into risky assets. Now that such policies are reversing, stocks and corporate bonds are vulnerable—and so is the economy. The optimists, by contrast, believe that markets are led by the economy. Only when it shows weakness, and profits slump, is it time to get out. There is no rational reason to buy a geriatric bull market that has 3-5% upside and 40-50% downside. But we have finally reached the point where investor risk/reward metrics have absolutely nothing to do with the daily bumps and grinds of the stock averages. That is to say, the chart monkeys now own the casino lock, stock and barrel. The alternating red and green flickers on the tickers discount nothing real because everything which is real points to crunch time ahead. — monetary union without banking union will not work. The Prime Minister overplayed her hand disastrously by trying to bounce the Cabinet and the Parliamentary party into support for a settlement that violates the electoral manifesto, the Lancaster House speech, the verdict of the referendum, and the minimum conditions of sovereign self-government. “The world has never been so indebted – even more than before the 2007 crisis – and this debt has never been so risky,” said the Autorité des Marchés Financiers (AMF) in its annual report. Germany’s Target 2 surplus is on track to reach €1tn. DN om folkpartiet: Hur länge är folkets nej till eurosamarbetet giltigt? Och vad ska EU egentligen ägna sig åt? Att skrota den svenska kronan nu kan ju inte vara en valvinnare. Hungern efter den federalistiska agenda som Jan Björklund presenterade i Almedalen, och ”Mer EU!”, är dessvärre dämpad. that could have brought down the nation’s entire financial system. 217 per cent of gross domestic product, up from 179 per cent a decade ago. This partly reflects government borrowing. However, corporate leverage has also exploded, particularly among western high-risk borrowers and emerging markets companies, most notably in China. These meteorological events are linked by the behaviour of the jet stream, the band of fast winds blowing west to east in the upper atmosphere. Movements in the wavy path that the jet stream follows around the globe play a key role in determining weather conditions. The end of Greece’s debt crisis, and a Franco-German accord to redesign the eurozone. Unfortunately, both reports offer fresh proof of the European Union establishment’s remarkable talent for never missing an opportunity to miss an opportunity.